Same here. If I wait more than 5 days tween mowing I get clumps of grass even mowing at 3 1/2". I'll be happy to get to once a week mowings. We’ve had a LOT of rain last week. Way too wet to do anything. It cleared off Sunday afternoon and by Monday it was dry enough to mow and not get stuck in the mud. Started the mower but the blades wouldn’t turn. Took a while to figure out what was wrong, trip to the dealer,replaced the switch for the electric clutch and got a little mowing done. Yesterday planned to finish because some of the grass is 8-10 inches tall! Mower wouldn’t start ignition switch is bad! Out of stock at my dealer so ordered one from our friends in Pennsylvania. Should be back in business in a couple of days. Fortunately both switches are snap in mounting and plug into the wiring harness. Kubota ZG127S with 277 hours. Shouldn’t be having trouble this early. Now for the “if it wasn’t for bad luck I wouldn’t have any luck at all” part of the story. The BX tractor has a belly mower so,I decided to mow with it this morning. Takes longer and doesn’t do as pretty a job but at least get it done. Left front was flat as a pancake and when I tried to air it up I could hear the air leaking out. Took the tire to the dealer and now I’m setting on the porch with a glass of tea watching the grass grow. I can relate all to well to that story Jim. My old White (MTD) 42" ride on mower finally popped it's clogs. 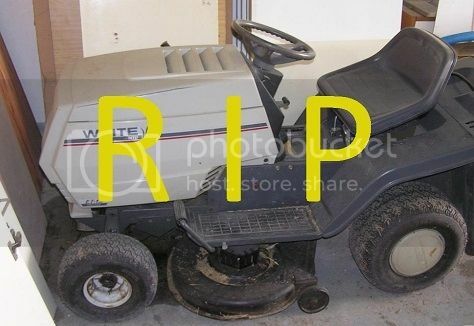 I've been patching and repairing that old thing for years but a few weeks ago it crapped out big-time while out mowing, so I finally accepted it was time to lay it to rest. This is a good time of year to buy mowers being end of season and all, so I decided to go get myself a 5ft finish mower at a decent price. It's got the mulching kit, so my days of bagging my grass clippings are over for now. I really couldn't be happier with the finish on the lawn. It's taking a bit of effort learning how to mow with a rear deck, but thats the fun of it I guess. Nice set up quincy. I bet you'll like it better than the little work horse that has past on. RFM does take some getting used to, and you might need a small push mower for tight spots but you'll get er done. If I mow the next few days it’s going to be with the tractor instead of the zero turn. Didn’t realize the pulley had a metal outer with the v grove but a plastic center! My ZTR wasn't in a secure building over the winter (it was stored in an open air but covered area). When I put it away, apparently I decided to set all controls where a safety switch was in use. When I went to start it last week it took me a few minutes to remember all the settings so I could get it started up and moving/mowing again.
. When I went to start it last week it took me a few minutes to remember all the settings so I could get it started up and moving/mowing again. I know that feeling. I have to reacquaint myself with the mower each spring. One season I thought I had a completely dead battery, so I charged it and it still would not start. I was about to take the battery out and replace when it dawned on me ...the safety switch. Duh. Fired right up after that. No sure what was going on Chris. I just checked and the upload attachment box was there and once clicked the select image boxes were available. Try again please and let me know if more issues. Maybe try a different browser, I'm in Chrome right now. I suspect a VB update caused this because both browsers get that same result and I see the same result on another VB-based site I read daily, 'Upload from Computer' disappeared both places. I tried changing things in my profile here to resolve this but I have not changed my profile there, no joy. On the contrary, TBN's photo entry box still has the 'Upload from Computer' tab. Anyhow, I had some first mow pix taken March 15 to upload. 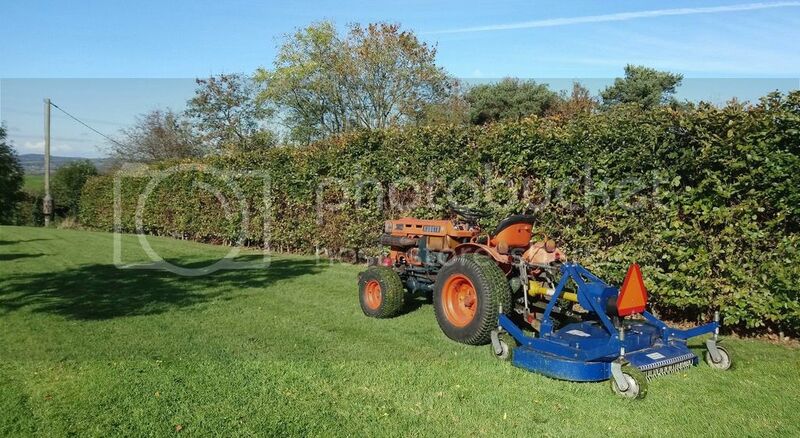 'First Mow' here is the orchard contractor shredding pruning debris with a big flail mower. I have mow pix on here from several years ago. Here's one I posted in 2010 showing a year when I did the mowing after the contractor said 'You're on your own, I can't find any market for the apples this year'. (He eventually came back and did his normal discing after he found a contract). Entering the URL of this photo that is already on NTT, worked normally. To post from your computer, use the "Attach Files" option below the text box. It's not available in quick reply, you need to choose "go advanced"
One crawler piling large orchard debris, other crawler shredding pruning debris with flail mower. ... use the "Attach Files" option below the text box. My pix were 800 x 600 and about 300k each. I went back and renamed my pix to jpeg then uploaded again. This time the upload process reduced them to 700 pixels wide and under 200k filesize. Whatever. Now the post looks like I intended. Again, Zoom thanks for your advice! Duh. I thought you were using the Attach Files button. I thought you were using the Attach Files button. I just looked and I don't see an upload from computer button either, but I've never used that, so I'm not sure where it should be. I do see the paper clip and if I click it a window opens that lets me upload attachments from the computer. Does that help?